The massive and humbling Mount Elbert affords hikers summit approaches that do not demand technical skills. Bagging the tallest of Colorado's 14ers lies within reach! 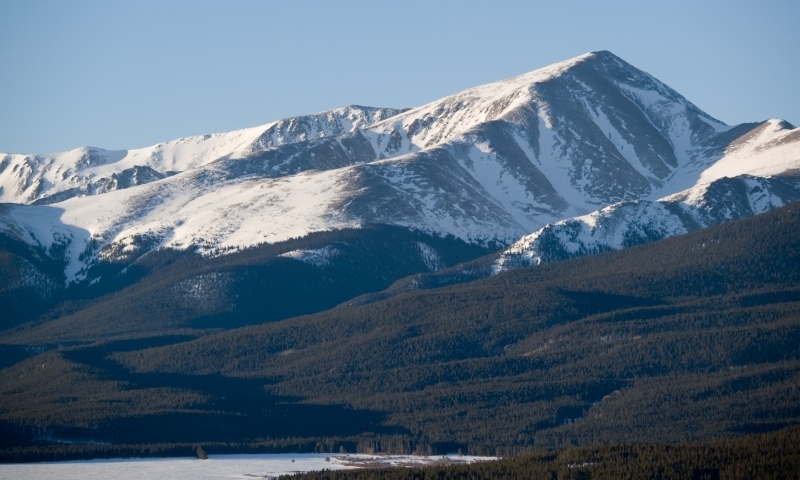 At 14,433 feet, Mount Elbert is the tallest peak in Colorado and the second tallest in the country's lower-48 states. Located in San Isabel National Forest in Leadville Ranger District (719) 486-0749. A summit attempt of the mountain should be made during the warmer days of July and August. The mountain offers excellent terrain for backcountry skiing during the snow season. Numerous campgrounds avail scenic sites and access to hiking, biking, paddling and fishing. Standing at 14,433 feet, Mount Elbert holds the title of second tallest summit in the lower 48 states (surpassed only by Mount Whitney) and the highest in the Sawatch Range, which heralds 15 summits over 14,000 feet! Though bagging this peak requires endurance (hikers must surmount over 4000 feet in elevation), the summit can be reached without technical mountaineering skills or tools, during much of July and August. Make the proper arrangements, and get after it! Mount Elbert can be found south of Leadville, CO, and just northwest of the town of Twin Lakes on the eastern side of Independence Pass (Highway 82). For access to terrain north of the summit of Mount Elbert, follow these directions: from Leadville, drive south on US24. Take a left at CO-300 E, driving about a mile to County Road 11 where you're gonna hang a left. After about a mile and a half, take a right onto Halfmoon Road (CR110) and look for campground signs (Elbert Creek and Halfmoon). For more information on Mount Elbert, contact the San Isabel National Forest at its Leadville Ranger District office (719) 486-0749. While most traffic comes through Mount Elbert's forest trails, during the summer months of July and August, Mount Elbert is a destination for ski mountaineers in the winter months as well. Those planning hikes in the summer months should prepare for sever thunderstorms in the afternoon hours and for drastic drops in temperature. It is not unusual to encounter snow conditions at the summit in the summer. Early departures, near dawn, are highly advisable. For winter expeditions, avalanche safety measures should be exercised and thorough preparations made. For up-to-date information on weather and conditions, contact the Leadville Ranger District. This trailhead allows for a hike along the northeast ridge of Mount Elbert on a fairly well-maintained and generally well-marked trail. This is the most popular and "easiest" approach to summit. The trail runs about 4.6 miles, one way, with steep grades, especially between miles 3 to 4.5, during which hikers cover about 2000 feet elevation. To find the trailhead, follow directions (above) to Halfmoon Road, following signs for Elbert Creek. The trailhead can be found just past the Elbert Creek Campground. The first section of the trail is actually named Colorado Trail but signs indicate clearly the Mount Elbert Trail when you arrive at the junction. This trail allows for a hike along the east ridge of Mount Elbert and runs about 5.5 miles, one way, with 4600 feet elevation gained. The trailhead can be found at Shore Pretty Overlook on Highway 24 just north of the town of Twin Lakes, CO. Like the North Trail, this trail is classified as a Class I climb and allows horse riding. This moderately strenuous hike, follows Black Cloud Creek north to the mountain's southeast ridge and gains nearly 5000 feet in elevation. The trailhead can be found (by those with sharp vision) on US-82, 10 miles west of the junction with US-24. A small sign, just west of Twin Peaks Campground, marks the turnoff on road approaching Independence Pass. Other approaches include: Echo Canyon Trail for southwest ridge and South Halfmoon Creek Trail for an ascent via northwest ridge. For information on trail conditions, weather and other factors that will affect a summit ascent, contact Leadville Ranger District offices at (719) 486-0749. Since Mount Elbert has several non-technical approaches, much of the mountaineering, so to speak, happens during the winter months as the snow falls. Ski mountaineering approaches most commonly used are North or South Mt. Elbert Trails. As winter weather conditions can change dramatically and various events can trigger avalanche slides, be sure to exercise caution and educate yourself about backcountry winter travel, before setting off on a winter ascent. Mountain Biking: A trail around Twin Lakes, clocking in at over 14 miles, is a popular route. Road Cycling: The traverse over the Sawatch Range on Independence Pass Road, steep and arduous as it may be, is immensely popular among Aspen's road bike enthusiasts. The stretch of Highway 82 from Aspen to Twin Lakes measures 32 miles long. Elbert Creek Campground: This popular campground works with a first-come, first served basis for sites at a fee. There are 17 campsites available from late-May to early September, each available for a maximum of 14 nights. Elbert Creek Campground offers access to trailheads for Mount Elbert and Mount Massive, as well as proximity to Clear, Elbert and Lake Creeks, good sites for whitewater paddling. From Leadville, CO, take US-24 south about 2 miles to Halfmoon Campground/State Rt. 300 signs. Turn right onto CO-300, driving less than a mile to another campground sign. Turn left and go just over a mile to Halfmoon Drainage sign. Turn right at the sign onto Halfmoon Road, a single lane dirt and gravel road (with turnouts). Just past miles 5, you will see signs for Halfmoon Campgrounds, continue another miles and a half and follow signs for Elbert Creek Campground. Halfmoon Campgrounds(East and West): Follow directions (above) to Halfmoon Road from Leadville, CO. Drive about five and quarter miles to signs for the campground. First you will come upon the Halfmoon East section of the developed sites, next Halfmoon West. There are twenty sites available on a first come, first served basis, at a rate of $13 per day. Call Leadville Ranger District for more info. Lakeview: One of five designated campgrounds located in Twin Lakes Recreation Area, east of Mount Elbert, this campground offers over 50 sites, with family and groups sites, too, all available by reservations. Providing seclusion and beautiful vistas, as well as access to many activities on water and land, stays are limited to two weeks at a time. Also, RVs and campers must be no longer than 32 feet to occupy a site. Call 1-877-444-6777 or visit http://www.reserveamerica.com/ for reservations and information.